When your husband is out of town for a school residence week? (Besides calling 9-1-1 and learning how to install new door knobs throughout your house). 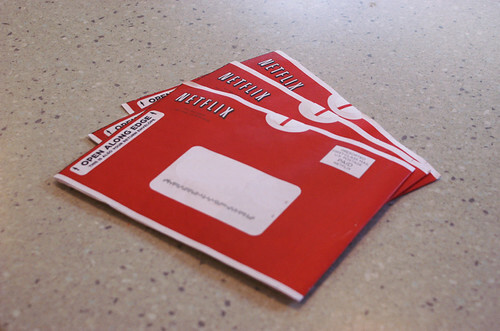 I decided to activate a free trial of Netflix. And have every foofy romantic movie on my wish list sent to me. As well as a movie I’d never heard of before that had the most touching story line I’ve ever seen and made me cry at least 10 different times. So, although it didn’t compare to having my dear husband at home, I’d like to officially thank Netflix for their generosity and friendly company on my lonely nights alone. (And may you not wait too long before offering me another free trial). Glad you had some good entertainment for the lonely evenings. Life feels so different without the man of the house around, doesn’t it? Love your movie choices. 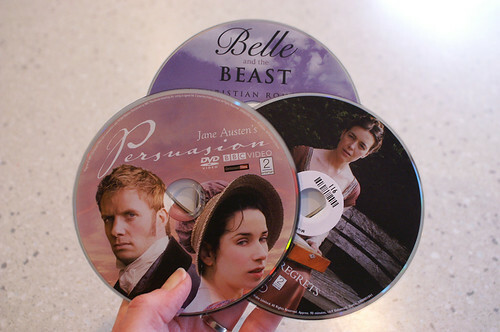 I’ve been trying to find Sense and Sensibility on DVD (to buy for my collection), but no one has it in stores any longer. I guess I’ll have to order it. Not sure which version you are looking for, but I bought Emma Thompson’s version for really cheap at Target. It was a while ago, but I know I’ve seen it there since I bought my copy. I think it was only $5. BTW, I don’t know if anyone else has had problems posting comments, but I tried a few times on your other posts and it gave me error messages? Maybe it was just user error, very possible! All those movies looked so great (I like the same kind). Thanks for mentioning the new one, we will have to see if we can get it, it looked good. Those are the same kind of movies I watch when Aaron is gone. Aren’t those free trials nice? How funny, I have Persuasion from Netflix right now too. Really?? I loved it! How did you like it?